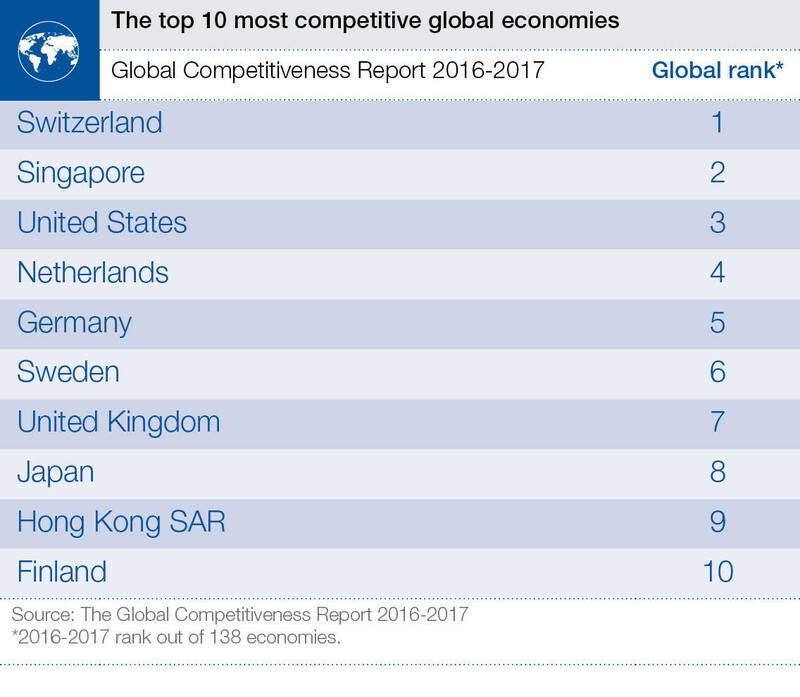 The US has maintained its third place on the Global Competitiveness Index for a third year in a row, but seriously lags behind other, much smaller countries in some of the most basic measures, the latest Global Competitiveness Report reveals. The competitiveness of the US is largely driven by six of the 12 pillars of competitiveness outlined in the annual Global Competitiveness Report: innovation, business sophistication, market size, financial market development, labour market efficiency, and higher education and training. While these are essential elements in stimulating economic growth, the US does not fare so well in the pillars that are considered basic requirements, such as infrastructure and healthcare. In fact, the US does not rank in the top 10 on any of the basic requirements pillars, which are institutions, infrastructure, macroeconomic environment and health and primary education. For instance, the US lags behind the much smaller Tanzania in terms of its macroeconomic environment, in 70th place versus Tanzania’s 69th. That said, it’s an improvement from last year, when the US came in at 96th. This is due in part to its declining budget deficit. In terms of health and primary education, the US has seen a downward trend, plummeting from 18th position in 2015 to 39th in the latest report. In terms of the quality of its infrastructure, the US is in 11th place, beaten to the top 10 by some much smaller countries such as Japan and the Netherlands. Its rank in institutions is 27th, behind Malaysia, Bahrain and Saudi Arabia. When you look even closer, it comes in at 30th in the ethics and corruption subsectors, 29th in undue influence, and 40th when it comes to distrust of politicians. Sustainable, long-term growth requires making progress on all 12 pillars of competitiveness, according to the report. The pillars all complement each other, so for example innovation and sophistication within business will start to fall if other conditions, such as a stable financial sector, are not in place. Similarly, workplace productivity could fall if health is not protected. These gaps in competitiveness are starting to take a toll on the US. Low productivity growth, monetary stimulus running out of steam and stagnating wages are all factors that need monitoring, according to the report. The US needs a new, comprehensive competitiveness agenda if it wants to continue leading in the rankings and reigniting growth to sustain growing employment, wages and inclusiveness.